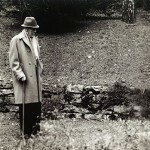 We have a new Events page on the site which will list upcoming literary events. You can subscribe to the calendar for this but every now and then we feel compelled to draw your attention to something we are looking forward to. 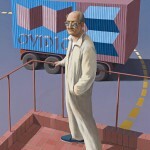 This Friday David Malouf will be speaking with artist Jeffrey Smart. Malouf will talk of his friendship with the artist and discuss the artist’s work in conversation with Mark Ledbury, Power Professor of Art History and Visual Culture, Director of the Power Institute and curator of the new exhibition Jeffrey Smart: Unspoken. In 1980 Jeffrey Smart painted a portrait of Malouf. There is also a study that was made in this process. Both paintings feature the word OVIDIO which is a reference to the poet Ovid whose exile inspired An Imaginary Life, Malouf’s 1978 novella. Smart also painted Germaine Greer, Margaret Olley, and Clive James. 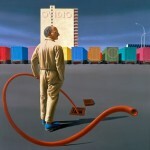 The exhibition Jeffrey Smart: Unspoken runs from October 2nd to November 27, 2011.